Combine the ground cookies and melted butter in a large bowl. Pour the mixture into a 9x13 baking dish. Lightly mash the cookies to form the crust; refrigerate for 10-15 minutes before preparing the filling. Heat the oven to 350°F. Blend the cream cheese with the evaporated milk, 1 cup of coconut cream, 1 cup of shredded and the 3 eggs. Pour the mixture onto the crust. Bake for 20-25 minutes or until the center curdles. Remove from the oven and let cool at room temperature. Decorate with lightly toasted coconut before serving. Enjoy! 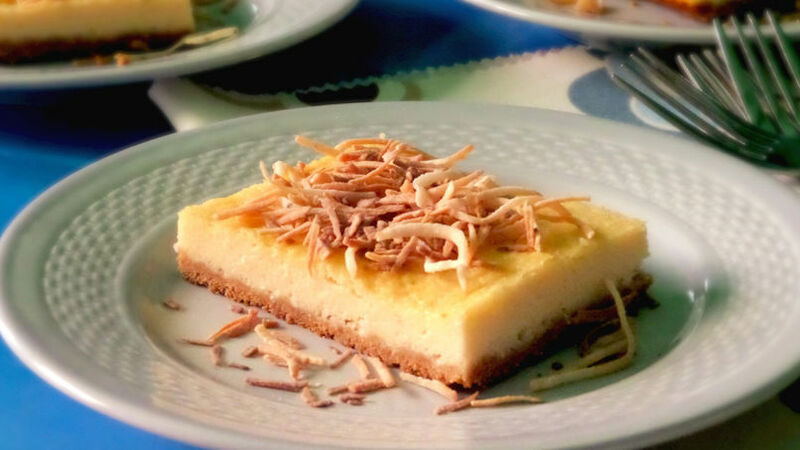 You can make a coconut cheesecake with this recipe; just use a rectangular dish. I don't know why, but as soon as the weather starts getting warmer I get a craving for coconut. Perhaps it has something to do with the bright sunshine that makes me feel like I'm on a tropical island, especially after this long and cold winter. Who knows? All I'm sure of is that I love coconut and I think these coconut cheesecake squares are the perfect dessert to serve at a family picnic or barbeque.